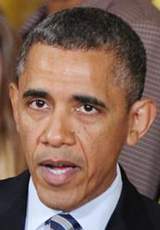 WASHINGTON  President Barack Obama will visit Denver on Wednesday to discuss gun control, the White House said. Obama will continue to ask the American people to join him in calling on Congress to pass commonsense measures to reduce gun violence, deputy press secretary Josh Earnest said Thursday during a White House press briefing. Obama will meet with local law-enforcement officials and community leaders in Denver to talk about Colorados new gun legislation. Gov. John Hickenlooper signed three bills March 20. They ban the sale of ammunition magazines larger than 15 rounds, require background checks for private-party gun sales and require gun buyers to pay for their background checks. Two more gun bills still are being considered and had hearings in the House on Thursday. One would require in-person training for concealed-weapons permits. The other would require certain domestic-violence suspects and offenders to relinquish their guns. Gun-rights activists are targeting three Democrats for recall  Rep. Mike McLachlan, D-Durango, Senate President John Morse, D-Colorado Springs, and Sen. Evie Hudak, D-Westminster. Mike Saccone, spokesman for Sen. Mark Udall, said the Colorado Democrat welcomes the presidents visit. Udall believes politicians must continue to work together to avoid tragedies such as the movie-theater shooting in Aurora last summer, Saccone said. James Holmes is accused of killing 12 people and injuring 58 more in the Aurora movie theater. Sen. Michael Bennet, D-Colo., agrees, said spokesman Adam Bozzi. Sen. Bennet believes we need to do more to get the wrong guns out of the wrong hands, Bozzi said in an email. U.S. Rep. Scott Tipton, R-Cortez, could not be reached for comment. Joe Hanel reported from Denver. Stefanie Dazio is a student at American University in Washington, D.C., and an intern for The Durango Herald. You can reach her at sdazio@durangoherald.com.